The trip begins with you being picked up from your hotel in Punta Arenas or Punta Arenas airport in the morning and driven to EcoCamp Patagonia, located in the world-famous Torres del Paine National Park. 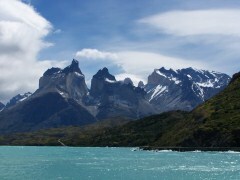 Alternatively you can start your trip in Calafate. En route we make a couple of stops - first in Puerto Natales, a small, lively town on the shores of "Seno de Ultima Esperanza", where we enjoy a hearty local lunch, and second at Cueva de Milodon, a massive prehistoric cave where the remains of a giant ground sloth were discovered in the 1890s. The whole journey is very scenic, with plenty of wild birds and wonderful landscapes to be seen. 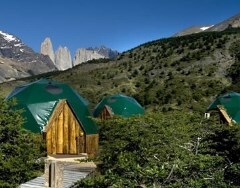 The day ends with our arrival and overnight stay at EcoCamp Patagonia, nestled in the heart of the park with a view of the Torres. During summer the sun sets around 11pm, so upon arrival there's plenty of light to admire the Patagonian steppe with its guanacos and snow-peaked mountain horizon. This 17 km biking excursion follows a single track through Cañadón Macho, finishing at a junction with the road near Cascada Paine. Although the cycling is not too demanding, there are some sections of the trail that have some difficulty at the point where Cañadon Macho crosses a meadow and starts climbing, followed by an undulating stretch of descent, which is a little steep and rocky. After enjoying our boxed lunch at Laguna Azul, if the group feels like it, the bike ride can be extended for an additional 10 km further inside Estancia Laguna Azul. Back at EcoCamp, the cyclists reunite with their Safari hiking counterparts to enjoy the evening aperitif. Breakfast, Boxed Lunch & Dinner included. After breakfast at EcoCamp we head off at 9am to Grey Lake in the western sector of the park, about a two hour drive away. The first part of our day is spent kayaking on Grey Lake then later kayaking down Grey River. After a safety briefing we get on our kayaking gear (gloves, life jackets, spray skirts, booties) and get into our single or double kayak. We then paddle out into the lake and head towards the piercing blue icebergs which have floated downstream from the Grey Glacier. After navigating our way along the shoreline past the impressive icebergs we break for lunch on the lake shore. Energised after lunch we continue our glacial adventure, boarding a boat heading right up to the glacier's towering face. The boat ride lasts approximately 3 hours and we get to enjoy views of the Paine massif as well as the impressive glacier which forms part of the Southern Patagonian Ice Field. After the glacial boat ride we board the van to go back to EcoCamp for our evening aperitif and meal. One of the best ways to enjoy all that Patagonia has to offer is by riding through it on horseback. This excursion departs at 9:30am after we have a hearty breakfast at EcoCamp. We will admire the most spectacular parts of Paine hill with a full day of horseback riding. Venturing through forest and crossing streams all while surrounded bu the amazing greenery. There are 5 different prairies along this trip and experienced riders are welcome to gallop through these parts. If you visit in February you will be able to see the Encantado Valley. Lunch will be served at the Seron campsite, where we will enjoy a spectacular view, featuring parts of Las Torres, Mount Admiral Nieto, the Blue Lagoon and the Paine River. Depending on our group we can decide to stay out riding past 4pm or choose to head back early to EcoCamp and enjoy an evening cocktail. If you like horseback riding this is the perfect adventure for you. We walk from EcoCamp towards Hosteria Las Torres and join the uphill path to Ascencio Valley on the Tower's eastern face. Dry mountain spots, beech forests and small rivers line the scenic walk towards the valley. 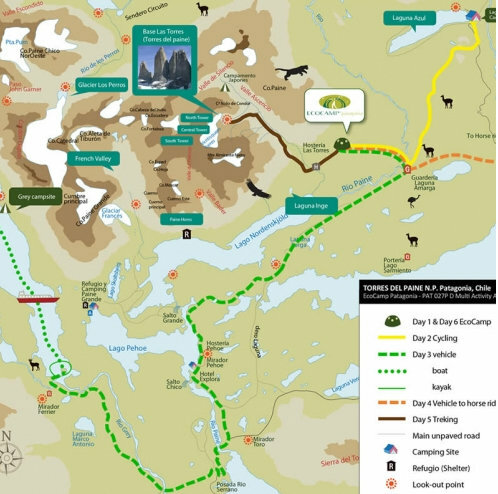 Our big challenge comes as we climb the steep moraine, a mass of boulders leading us towards one of the world's most famous views overlooking the Towers. The famous Torres del Paine consists of three gigantic granite monoliths, the remains of a great cirque sheared away by the forces of glacial ice. After an uphill slog, the Towers eventually come into full view, rising majestically before us, with the glacial lake visible below. After feasting on the view and our picnic, we backtrack along the same trail through Ascencio Valley and return to EcoCamp. We board an early morning vehicle, sit back, relax and enjoy a scenic ride back to Punta Arenas on time to catch the evening flight to Santiago. 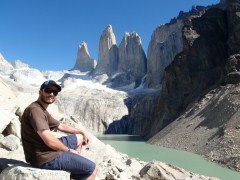 Ecocamp Patagonia is located in the heart of Torres del Paine National Park in Chile, with a unique view of the majestic granite towers. 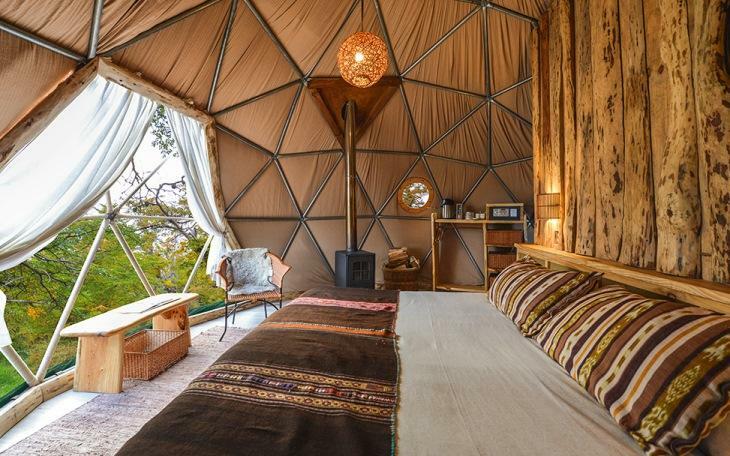 The region’s first fully sustainable accommodation south of the Amazon and the first of its kind in the Patagonian wilderness, EcoCamp offers upscale camping in geodesic domes inspired by the region’s ancient nomadic inhabitants. 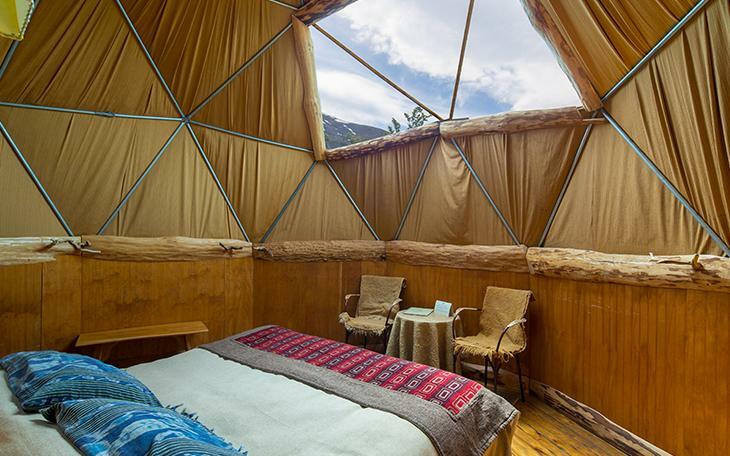 EcoCamp Standard domes were the world's first geodesic dome hotel room. They are resistant to the strongest Patagonian winds, rains, and snow and come equipped with two single beds (doubles on request), very cozy fleece blankets, feather quilts and organic elements for decoration. There are round windows in the ceiling to look up at the stars. Standard domes have shared bathrooms which are large, comfortable and gender divided. Suite domes were designed to further our goal of providing comfort in a natural setting with minimal environmental impact, and also maintain the hotel’s familiar and cozy vibe. 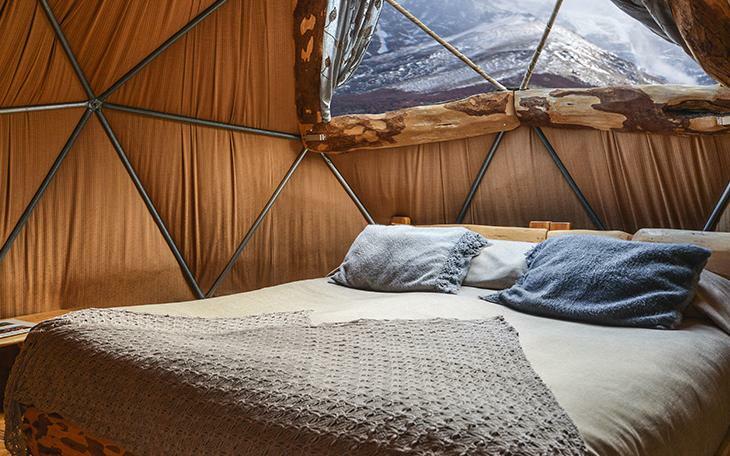 The domes have comfortable double or twin beds, a wood stove and a private bathroom with a state-of-the-art composting toilet. Stargaze through the ceiling windows while falling asleep, after enjoying a spectacular sunset from your private terrace. Spacious, comfortable and equipped with private bathrooms, Superior Domes are the optimum choice for trekkers wanting that bit more space and comfort at the end of a long day’s walk. Each Superior Dome has comfortable queen-size or twin beds, a propane heater, skylight windows and a private bathroom with a sophisticated composting toilet.